The President of the United States of America (POTUS) is the elected head of state and head of government of the United States. 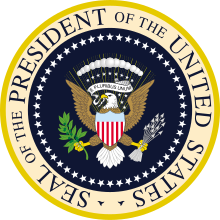 The president leads the executive branch of the federal government and is the commander-in-chief of the United States Armed Forces. The President of the United States is considered one of the world's most powerful people, leading the world's only contemporary superpower. The role includes being the commander-in-chief of the world's most expensive military with the largest nuclear arsenal and leading the largest economy by real and nominal GDP. The office of the president holds significant hard and soft power both in the United States and abroad. No president of the United States could represent the United States were he not committed to human rights. If you don't understand this, you can't deal with us. Joseph Biden, as quoted in "Born Red: How Xi Jinping, an unremarkable provincial administrator, became China’s most authoritarian leader since Mao." (6 April 2015), by Evan Osnos, The New Yorker. PRESIDENT, n. The leading figure in a small group of men of whom—and of whom only—it is positively known that immense numbers of their countrymen did not want any of them for President. Ambrose Bierce, The Devil's Dictionary, p. 266 (1948). Originally published in 1906 as The Cynic's Word Book. The President is an elected king, but the fact that he is elected has proved to be of far less significance in the course of political evolution than the fact that he is pragmatically a king. It was the intention of the founders of the Constitution that he be elected by a small body of notables, representing the ruling propertied classes, who could check him up every four years in a new election. This was no innovation. Kings have often been selected this way in European history, and the Roman Emperor was regularly chosen by election. Randolph Bourne, ¶19 of §II of "The State" (1918). Published under "The Development of the American State," The State (Tucson, Arizona: See Sharp Press, 1998), p. 36. If peace is your goal, which it's got to be a goal for any American president, it matters a lot whether people live in a free society. George W. Bush, speech at the Gerald R. Ford Foundation (2011), Michigan. I like to tell the 'C' students... You too can be president! George W. Bush, remarks by President George W. Bush at SMU's 100th Spring Commencement Convocation (16 May 2015). In order to be an effective president... when you say something you have to mean it. The cheek of every American must tingle with shame as he reads the silly, flat, and dish-watery utterances of the man who has to be pointed out to intelligent foreigners as President of the United States. Attributed to The Chicago Times, following President Abraham Lincoln's address at Gettysburg on November 19, 1863; reported in Carl Sandburg, Abraham Lincoln: The War Years (1939), vol. 2, p. 472; no date of issue for the Times is given. This quotation also appears in Robert S. Harper, Lincoln and the Press (1951), chapter 33, p. 287, also without a specific date for the Times, citing only Sandburg. This same quotation and attribution is used in Gore Vidal, Lincoln, part 3, chapter 2, p. 494 (1984, reprinted 1985). This quotation could not be found in The Chicago Times, November 20–25, 1863. And still the question, "What shall be done with our ex-Presidents?" is not laid at rest; and I sometimes think Watterson's solution of it, "Take them out and shoot them," is worthy of attention. Grover Cleveland, letter to William F. Vilas, April 19, 1889; Allan Nevins, ed., Letters of Grover Cleveland, 1850–1908 (1933), p. 204 (1933). Henry Watterson, editor of the Louisville, Kentucky, Courier-Journal for fifty years, feared that a president's ambitions would lead him to seek a third term and then life tenancy. Because any other position after the presidency would seem anticlimactic, Watterson believed the country was not safe from any president while he was alive. He especially worried about Theodore Roosevelt, a young president who greatly enjoyed the presidency, and he frequently editorialized on this theme during Roosevelt's second term, though the remark was facetious. Joseph Henry Wall, Henry Watterson (1956), p. 254–55. A president should unify us, should appeal to our better angels, should appeal to our shared values that make America who we are. Dwight D. Eisenhower, answer to question seeking his views on limiting U.S. presidents to two terms, news conference, Washington, D.C. (October 5, 1956), in Public Papers of the Presidents of the United States: Dwight D. Eisenhower, 1956, p. 862. Americans are intimately familiar with the image of a federal government paralyzed by the chief executive's unpopularity. Presidents Ronald Reagan in the early 1980s, Bill Clinton in the early 1990s, George W. Bush after the 2006 midterm election, and perhaps even Barack Obama in the first months after the 2010 midterm election. In one case in late 1995 and early 1996, the American government was literally shut down as Republicans attempted to overpower the unpopular Clinton in a federal budget dispute. But in none of these cases did the president, though his unpopularity had clearly incumbered the functioning of the state, offer to resign. And few Americans honestly expected resignation, even at the president's least popular moment. Max Fisher, "Why Do Japanese Prime Ministers Keep Resigning" (3 June 2011), The Atlantic. If you have not chosen me by secret ballot, neither have I gained office by any secret promises. I have not campaigned either for the Presidency or the Vice Presidency. I have not subscribed to any partisan platform. I am indebted to no man, and only to one woman—my dear wife—as I begin this very difficult job. Gerald R. Ford, remarks on taking the oath of office (August 9, 1974); in Public Papers of the Presidents of the United States: Gerald R. Ford, 1974, p. 1. I once told you that I am not a saint, and I hope never to see the day that I cannot admit having made a mistake. So I will close with another confession. Frequently, along the tortuous road of recent months from this chamber to the President's House, I protested that I was my own man. Now I realize that I was wrong. I am your man, for it was your carefully weighed confirmation that changed my occupation. The truth is I am the people's man, for you acted in their name, and I accepted and began my new and solemn trust with a promise to serve all the people and do the best that I can for America. Gerald R. Ford, address to a joint session of Congress (August 12, 1974); in Public Papers of the Presidents of the United States: Gerald R. Ford, 1974, p. 13. Gerald R. Ford, announcing his decision to pardon Richard Nixon (September 8, 1974); in Public Papers of the Presidents of the United States: Gerald R. Ford, 1974, p. 103. It is the manner of the New World and of a democratic society in which the Chief of the State is a plain Mr. President, who may be the ruler of a continent this year and may go back to his business of a private citizen next year. James A. Garfield, As quoted in Garfield of Ohio : The Available Man (1970) by John M. Tyler. No matter who is the President, that person never has the authority to 'order' members of the Armed Forces to violate the Uniformed Code of Military Justice, their ethos, their oath or the international law of land combat. The United States, for example, has never had a President as bad as George III, but neither has Britain had a king as admirable as George Washington (of whom William Thackeray rightly said that 'his glory will descend to remotest ages' while the memory of the sovereign went the other way). Still, even to concede this obvious argument is to make it plain that a bad monarch is at least as likely as a bad president even given the caprice of random selection by the hereditary principle... We find that the presidency has become too secretive, too powerful, too trammelled, too ceremonial, too impotent or too complicated, depending on the president under discussion or the critic making the analysis. On one thing all are agreed - there is a danger of an 'imperial' or 'monarchical' presidency. An incumbent in Washington knows he is in trouble on the day that cartoonists begin to represent him as a king. The second office of this government is honorable & easy, the first is but a splendid misery. Thomas Jefferson, letter to Elbridge Gerry (May 13, 1797), Paul L. Ford, ed., The Writings of Thomas Jefferson (1896), vol. 7, p. 120. And so it is that I carry with me from this State to that high and lonely office to which I now succeed more than fond memories and fast friendships. The enduring qualities of Massachusetts—the common threads woven by the Pilgrim and the Puritan, the fisherman and the farmer, the Yankee and the immigrant—will not be and could not be forgotten in the Nation's Executive Mansion. They are an indelible part of my life, my convictions, my view of the past, my hopes for the future. John F. Kennedy, address to the Massachusetts legislature (January 9, 1961); reported in Congressional Record (January 10, 1961), vol. 107, Appendix, p. A169. We need our presidents to appreciate and be polite to other cultures and leaders. But the president of the United States is the leading political figure in the world. He must command respect. Let others bow to him. Keith Koffler, "Obama Has Bowed Eight Times as President" (20 June 2012), White House Dossier. Allow the President to invade a neighboring nation, whenever he shall deem it necessary to repel an invasion, and you allow him to do so, whenever he may choose to say he deems it necessary for such purpose—and you allow him to make war at pleasure. Study to see if you can fix any limit to his power in this respect, after you have given him so much as you propose. If, to-day, he should choose to say he thinks it necessary to invade Canada, to prevent the British from invading us, how could you stop him? You may say to him, "I see no probability of the British invading us" but he will say to you "be silent; I see it, if you dont." Representative Abraham Lincoln, letter to William H. Herndon (February 15, 1848); in Roy P. Basler, ed., The Collected Works of Abraham Lincoln (1953), vol. 1, p. 451–52. In a certain sense, and to a certain extent, he [the president] is the representative of the people. He is elected by them, as well as congress is. But can he, in the nature [of] things, know the wants of the people, as well as three hundred other men, coming from all the various localities of the nation? If so, where is the propriety of having a congress? My friends—… I now leave, not knowing when, or whether ever, I may return, with a task before me greater than that which rested upon Washington. Without the assistance of that Divine Being, who ever attended him, I cannot succeed. With that assistance, I cannot fail. [D]ifferent and greatly distinguished citizens have, in succession, administered the executive branch of the government. They have conducted it through many perils, and generally with great success. Yet, with all this scope of precedent, I now enter upon the same task for the brief constitutional term of four years under great and peculiar difficulty... The chief magistrate derives all his authority from the people. Abraham Lincoln, response to a friend from Springfield asking how he liked being president, (c. 1861), in Emanuel Hertz, Lincoln Talks: A Biography in Anecdote (1939), p. 258–59. Walter Lippmann, Interpretations, 1931–1932 (1932), p. 262. 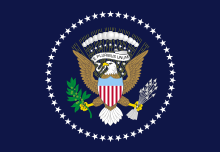 I think it absolutely necessary that the President should have the power of removing [his subordinates] from office; it will make him, in a peculiar manner, responsible for their conduct, and subject him to impeachment himself, if he suffers them to perpetrate with impunity high crimes or misdemeanors against the United States, or neglects to superintend their conduct, so as to check their excesses. James Madison, remarks in the House (May 19, 1789), Annals of Congress, vol. 1, col. 387. Richard Nixon, television address on NBC and CBS (September 19, 1968), in Nixon Speaks Out, Major Speeches and Statements … in the Presidential Campaign of 1968 (1968), p. 1. When I am the candidate, I run the campaign. Richard Nixon, remarks during an interview with representatives of the television networks (January 4, 1971), in Public Papers of the Presidents of the United States: Richard Nixon, 1971, p. 21. Representative William McK. Springer, remarks in the House, quoting Henry Clay: "As for me, I would rather be right than be President." Reed: "Well, the gentleman will never be either." Thomas B. Reed, reported in Samuel W. McCall, The Life of Thomas Brackett Reed (1914), chapter 21, p. 246. The President of the United States has long been the leader of the free world. The president and yes the nominees of the country's great parties help define America to billions of people. All of them bear the responsibility of being an example for our children and grandchildren. The Presidency is not merely an administrative office. That's the least of it. It is more than an engineering job, efficient or inefficient. It is pre-eminently a place of moral leadership. All our great Presidents were leaders of thought at times when certain historic ideas in the life of the nation had to be clarified. Franklin D. Roosevelt, reported in The New York Times Magazine (September 11, 1932), p. 2. My view was that every executive officer, and above all every executive officer in high position, was a steward of the people bound actively and affirmatively to do all he could for the people, and not to content himself with the negative merit of keeping his talents undamaged in a napkin. I declined to adopt the view that what was imperatively necessary for the Nation could not be done by the President unless he could find some specific authorization to do it. My belief was that it was not only his right but his duty to do anything that the needs of the Nation demanded unless such action was forbidden by the Constitution or by the laws. Under this interpretation of executive power I did and caused to be done many things not previously done by the President and the heads of the departments. I did not usurp power, but I did greatly broaden the use of executive power. In other words, I acted for the public welfare, I acted for the common well-being of all our people, whenever and in whatever manner was necessary, unless prevented by direct constitutional or legislative prohibition. Theodore Roosevelt, Theodore Roosevelt, An Autobiography (1926; vol. 20 of The Works of Theodore Roosevelt, national ed. ), chapter 10, p. 347–48. Our loyalty is due entirely to the United States. It is due to the President only and exactly to the degree in which he efficiently serves the United States. It is our duty to support him when he serves the United States well. It is our duty to oppose him when he serves it badly. This is true about Mr. Wilson now and it has been true about all our Presidents in the past. It is our duty at all times to tell the truth about the President and about every one else, save in the cases where to tell the truth at the moment would benefit the public enemy. Theodore Roosevelt, "Lincoln and Free Speech", The Great Adventure (1926; vol. 19 of The Works of Theodore Roosevelt, national ed. ), chapter 7, p. 297. Theodore Roosevelt, "Lincoln and Free Speech", The Great Adventure (1926; vol. 19 of The Works of Theodore Roosevelt, national ed. ), chapter 7, p. 289. Yes, Haven, most of us enjoy preaching, and I've got such a bully pulpit! Theodore Roosevelt, reply to George Haven Putnam, who had accused him of a tendency to preaching, sometime during his first presidential term, in George Haven Putnam, introductory essay, The Works of Theodore Roosevelt (1926), national ed., vol. 9, p. x. This country does not discriminate. No president, no officer in this country should hold office that has any hint of treating people differently because of the color of their skin or where they came from and that kind of thing. We believe in equality and fair treatment and that's the moral principle that we adhere to as a nation. William H. Seward, a retort to Stephen A. Douglas on the Senate floor, after the Illinois senator used an offensive slur in a speech. As quoted in Team of Rivals (2006), by Doris Kearns Goodwin (New York: Simon and Schuster), p. 163. The President must be greater than anyone else, but not better than anyone else. We subject him and his family to close and constant scrutiny and denounce them for things that we ourselves do every day. A Presidential slip of the tongue, a slight error in judgment—social, political, or ethical—can raise a storm of protest. We give the President more work than a man can do, more responsibility than a man should take, more pressure than a man can bear. We abuse him often and rarely praise him. We wear him out, use him up, eat him up. And with all this, Americans have a love for the President that goes beyond loyalty or party nationality; he is ours, and we exercise the right to destroy him. John Steinbeck, America and Americans (1966), p. 46. T.R.B. (Richard Strout), "Washington Wire", New Republic (December 15, 1952), p. 3. The plumber was secretary of labor Martin Durkin of Chicago, head of the Journeyman Plumbers and Steamfitters Union. See William Safire, Safire's Political Dictionary (1968), p. 195–96. The President can exercise no power which cannot be fairly and reasonably traced to some specific grant of power … in the Federal Constitution or in an act of Congress passed in pursuance thereof. There is no undefined residuum of power which he can exercise because it seems to him to be in the public interest. William Howard Taft, Our Chief Magistrate and His Powers (1916), chapter 6, p. 139–40. The Times, London, editorial about President Franklin D. Roosevelt's campaign in the South to influence voting in the forthcoming primary elections (August 16, 1938), p. 13. The White House almost certainly understands that a successful foreign policy rewards friends and punishes enemies, but the president can’t even get that right if he doesn’t know who his friends and enemies are. There has been a lot of talk lately about the burdens of the Presidency. Decisions that the President has to make often affect the lives of tens of millions of people around the world, but that does not mean that they should take longer to make. Some men can make decisions and some cannot. Some men fret and delay under criticism. I used to have a saying that applies here, and I note that some people have picked it up, "If you can't stand the heat, get out of the kitchen." Harry S. Truman, Mr. Citizen (1960), p. 229. When contemplating General Eisenhower winning the Presidential election, Truman said, "He'll sit here, and he'll say, 'Do this! Do that!' And nothing will happen. Poor Ike—it won't be a bit like the Army. He'll find it very frustrating". Harry S. Truman, in Richard E. Neustadt, Presidential Power, the Politics of Leadership (1960), p. 9. You know, the greatest epitaph in the country is here in Arizona. It's in Tombstone, Ariz., and this epitaph says, "Here lies Jack Williams. He done his damndest." I think that is the greatest epitaph a man could have. Whenever a man does the best he can, then that is all he can do; and that is what your President has been trying to do for the last 3 years for this country. Harry S. Truman, remarks in Winslow, Arizona (June 15, 1948); in Public Papers of the Presidents of the United States: Harry S. Truman, 1948, p. 356. The legislative job of the President is especially important to the people who have no special representatives to plead their cause before Congress—and that includes the great majority. I sometimes express it by saying the President is the only lobbyist that one hundred and fifty million Americans have. The other twenty million are able to employ people to represent them—and that's all right, it's the exercise of the right of petition—but someone has to look after the interests of the one hundred and fifty million that are left. Harry S. Truman, speech to the Press and Union League Club, San Francisco, California (October 25, 1956); at p. 19–20 of transcript. You know, the United States Government turns its Chief Executive out to grass. They're just allowed to starve... If I hadn't inherited some property that finally paid things through, I'd be on relief now. Harry S. Truman, as quoted in Plain Speaking : An Oral Biography of Harry S. Truman (1974) by Merle Miller, p. 228.